A perennial vine; the round, woody, twining vine of the moonseed family, with small clusters of purple berries and crescent-shaped seeds. Climbing woody vine; 8-12 feet tall. Root is bright yellow within. The leaves are smooth, with 3-7 angles or lobes; stalk attached above the base. Flowers small, whitish; in loose clusters; June to August. The fruit is globular, bluish-black drupe upto 1/2 inch across; resemble grapes. Native Americans used root tea for indigestion, arthritis, bowel disorders; also as a blood cleanser and “female tonic”. Poisonous. Fatalities have been reported from children eating seeds and fruits. 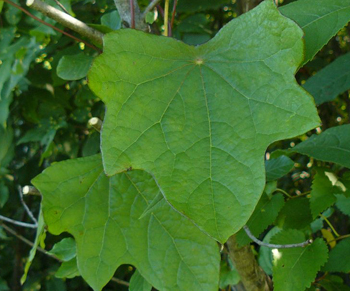 Some people reportedly confuse this plant with edible wild grapes. Care should be taken to correctly identify this herb. The black/purple berries are poisonous. The toxicity of the rootstock is due to its bitter alkaloids. Never use this herb without medical supervision.